We’re here to partner with overwhelmed dreamers who know (and LOVE) the work they do but don’t know how to share it, verbally or visually. Together, we build strategic brands that help small business owners confidently share who they are and sell what they do. As a team, we lay the foundation for your brand by helping you dive deeper into your brand purpose, get clear on who your dream clients are, see where you stand in comparison to the other players in your field and embrace your unique perspective. This service is tailored for those who need to not only refine their message, but need the visuals that match. You’ll walk away with a strong, strategic foundation for your brand as well as a brand identity system that attracts your ideal audience and makes you truly feel like a professional. + Brand Audit — We'll start the project by getting to know your brand deeply through discussions, branding exercises, and research. + Brand Strategy Blueprint — We'll deliver a document outlining the vibe and underlying strategy for the brand as a whole. + Logo design — Using what we learn about your brand from your new Brand Strategy Blueprint, we will create a visual identity for your brand. This includes three unique concepts to start with and three rounds of edits* as we narrow in on your perfect logo. + Logo variations — Once we finalize your logo design, we'll create a logo suite with any alternate layouts that best suit your needs – stacked, logomark, abbreviated, etc. + Brand colors — We will provide you with a custom color palette that aligns with your brand story. + Typography — We will select fonts that complement your branding and provide you with the font files for future use. + Logo file package — We will provide you with every file type that you or anyone working with your brand may need. + Brand Style Blueprint — This guide is for you and anyone working with your brand in the future. It will detail your brand’s fonts, color palette, guide you on when different file types should be used and more. This helps you maintain a consistent and professional image in the future. + Unlimited support— There's no limit to how many calls, emails, messages, or meetings. We'll be here for you throughout the entire process. YES! I'm interested and want to know more. After filling out the form — we'll send you a PDF with ALL the details on this service + schedule a free consultation call. We hate goodbyes, so let's just not say them! Our goal is to build long-term relationships with our dreamy clients + support them through their whole business journey. Hourly design + maintenance — We love working with brands we already know to help make updates and adjustments as needed. One-off coaching — As your business grows, we’re always happy to set up a coaching session to chat through your evolving brand strategy or messaging. Family status — Once you work with us, you become family. You’ll be at the top of our list when it comes to what’s next for your biz. We’d still love to work with you! While we offer standard services based on what our folks are most often looking for, we also believe that every project and client has unique needs. 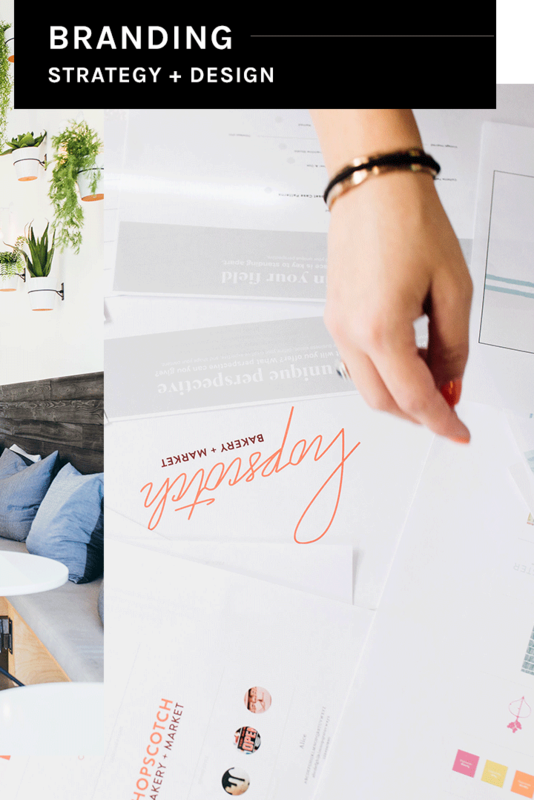 We’d love for you to reach out so that we can chat about your idea + build a custom proposal. No project is too small, and no location is too far. Don’t think you’re ready to work with us one-on-one? If it isn’t the right time for us to work together just yet, you can connect with us in a few other places. We offer exclusive content on branding via our monthly newsletter, which you can sign up for here. 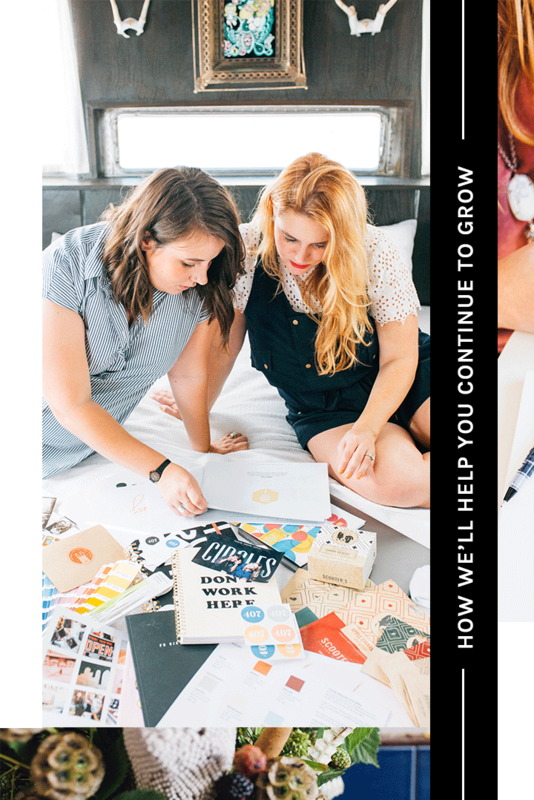 You can also head over to our blog, where we’re sharing what we our thoughts on branding, business, + plenty of free resources. You'll find the work we’ve created scattered across our blog, Instagram, and other nooks of the web - so we've decided to forgo a traditional portfolio. Also, we want you to work with us because of who we are and what we stand by - not because of that one logo we once designed. Your story, style, and vision are not the same as our past clients’ and our past work does not define our future potential. We could share 100 projects and you wouldn't see exactly what you're looking for, because it's not exactly what you need. All that to say, click one of the links above or send us an email and we’ll be happy to show you what we’re capable of.